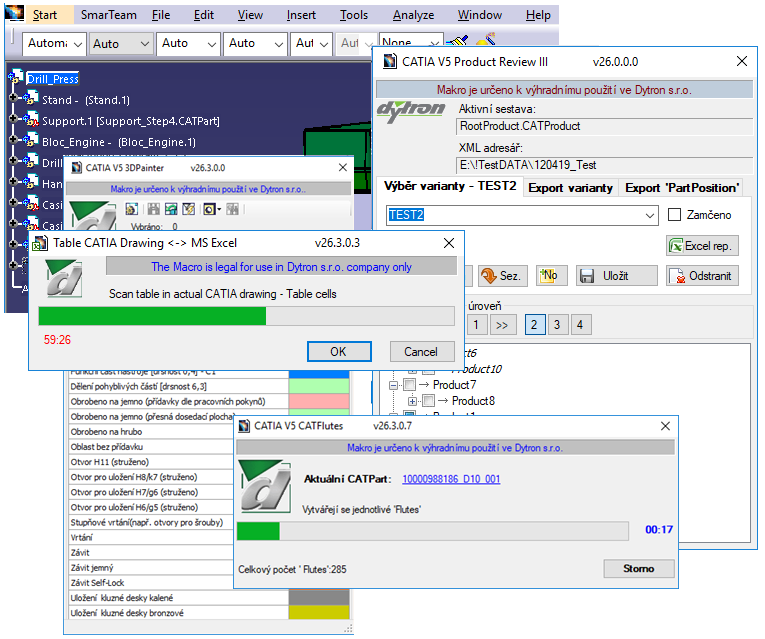 DYTRON applications and CATIA macros are tools that extend the functionality of Dassault Systèmes products (CATIA V5, CATIA 3DEXPERIENCE, ENOVIA, SmarTeam). DYTRON is developing a set of universal applications and automatizations that can be used in the CATIA, ENOVIA and SmarTeam environments, and are aimed at increasing the efficiency of workflows. We also develop applications and macros that are tailored to your specific requirements. Why use DYTRON applications or CATIA macros? Are your designers losing time on routine, repetitive activities? Would you like to save time by automating these activities? Request a catalog of our applications and CATIA macros to streamline your designers’ activities. Is your activity so specific that you didn’t select anything from the catalog? Contact us and we’ll create a customized application or CATIA macro. Do you want to create CATIA macros yourself and need advice on how to do it? Request the CATIA Automation training from us – programming in CATIA. Are you looking for inspiration in the field of CATIA macros?